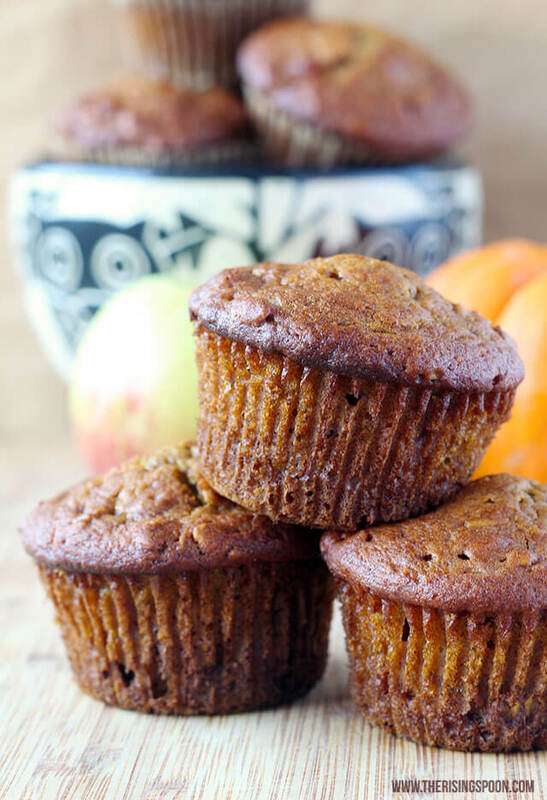 A healthy pumpkin apple muffin recipe that's incredibly moist and chock-full of fragrant pumpkin pie spice, cinnamon & nutmeg. Pumpkin puree and applesauce lend moisture while the oats, apple chunks, and cranberries provide a bit of texture. 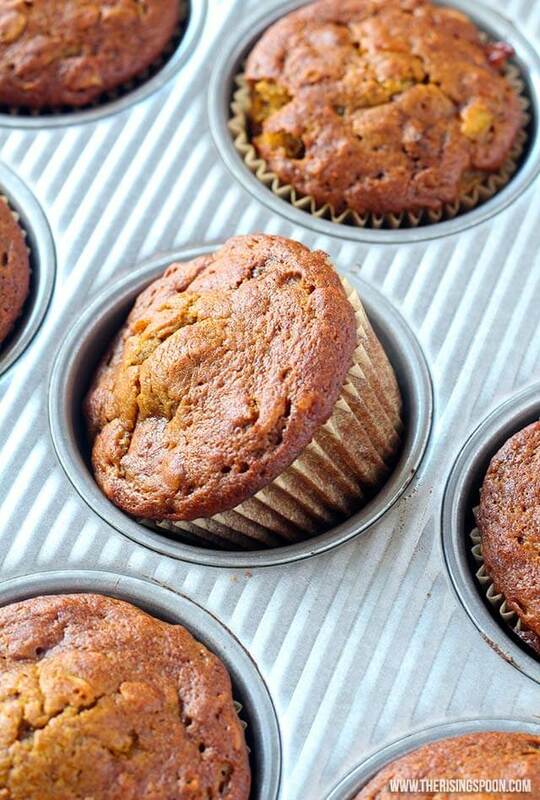 These are basically like fall in a muffin! 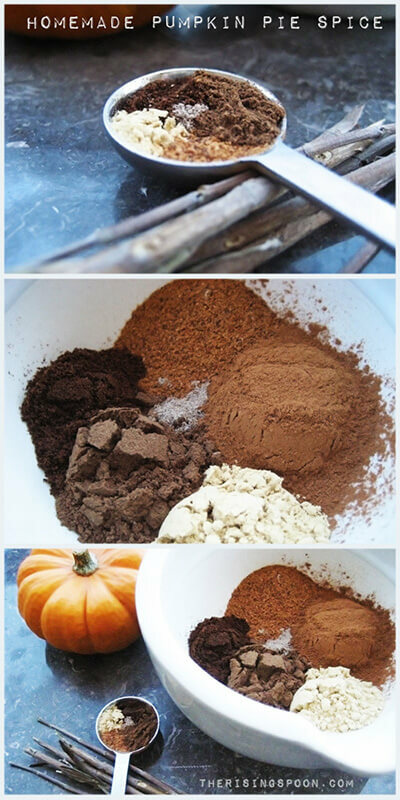 Are you aching to indulge in fall baked goods, but don't want something overly sweet? 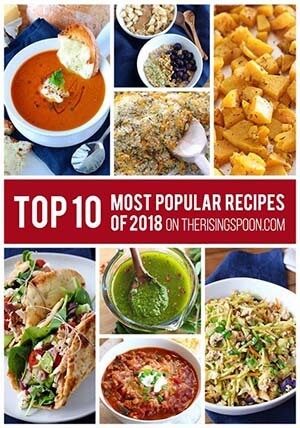 Look no further, friends! 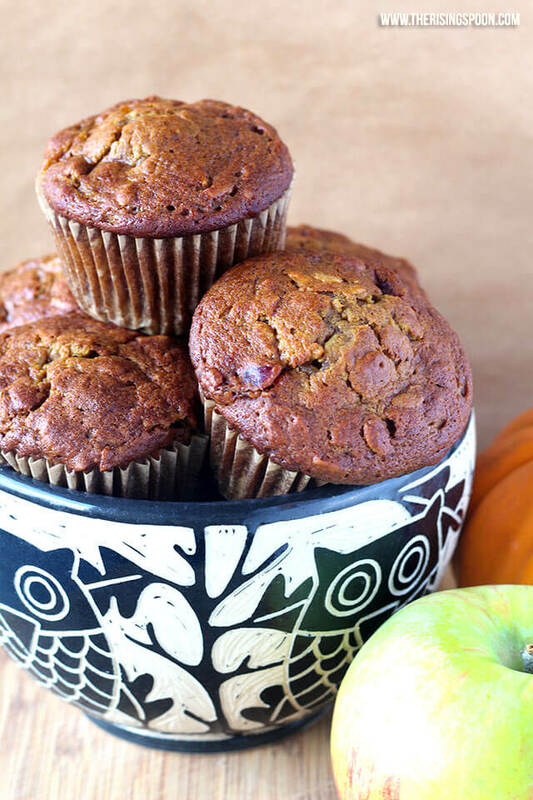 Here is a delectable, uber-moist (and dare I say healthy) pumpkin muffin that's chock-full of flavors without a ton a sweetness. That means you can eat 1-2 of these muffins, feel totally satisfied in a cozy comfort food sort of way, and not need to go take a nap an hour later. My recipe is adapted from these moist oatmeal pumpkin muffins, which had numerous comments about how the muffins needed more flavor, so the first thing I did was increase the pumpkin pie spice and sprinkle in a bit of extra cinnamon powder. And then after swapping out several ingredients--like applesauce instead of oil and water--I added in more fall mix-ins like chopped apple and dried cranberries. Perfection! I fondly call these treats "fall in a muffin". Cause that's what they are. Taking one whiff of the muffin's spicy aroma is equivalent to a sudsy bath, a tight embrace, a gossamer knit sweater, comfy slippers, and a lick or two from your favorite kitten or puppy. For serious, bake a batch of these muffins when you're feeling stressed and not only will your kitchen smell amazing, but you'll soon find yourself feeling more cheerful! Aromatherapy's pretty awesome like that. Oh, and did I mention they were moistest muffins I've ever eaten? How'd I achieve that? 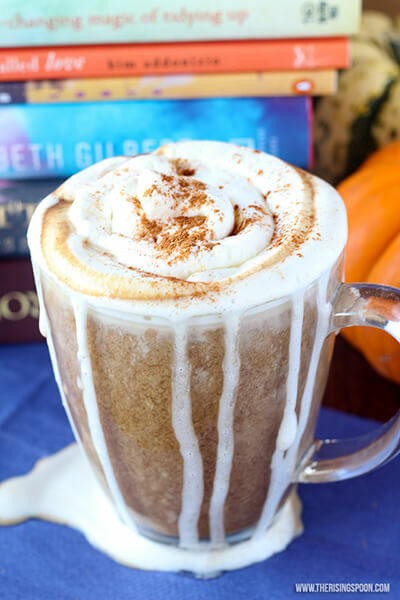 A mixture of pumpkin puree and unsweetened applesauce. No need for oil when you can use these two! Although if you want to get your butter on, I totally understand. 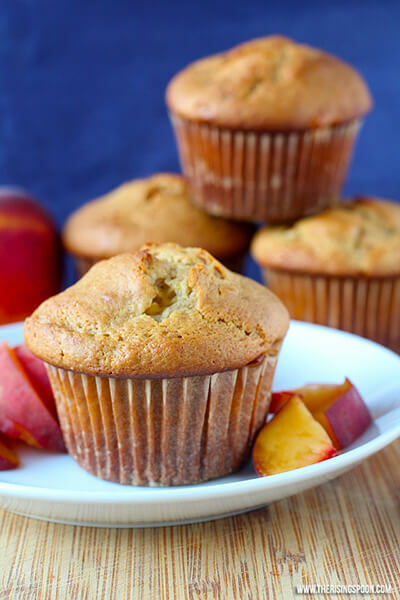 Especially if you love baked goods with fresh fruit like these peaches and cream muffins. Aaaaand, if you're vegan, simply replace each egg with 1/4 cup of mashed ripened banana. I almost did this but decided at the last second to try the egg method, assuming the banana would overpower the pumpkin or apple. Who knows, though, the flavors might mesh into a hybrid even-more-super-awesome muffin. 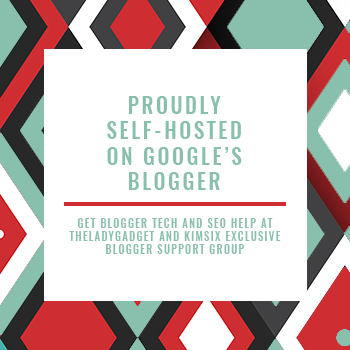 Please let me know if you try this! Update: If you like nuts in your muffins, definitely make a super quick batch of my stovetop candied pecans, chop up a handful, and throw those in the batter before baking! 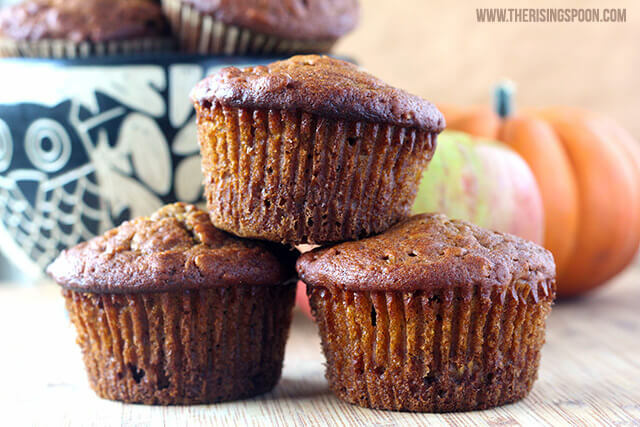 Incredibly moist pumpkin apple muffins chock-full of pumpkin pie spice, cinnamon & nutmeg. Pumpkin puree and applesauce lend moisture while the oats, apple chunks, and cranberries provide a bit of texture. Easily substitute mashed ripened banana for the eggs to make it vegan-friendly.